De Struise Pannepot Brunch at The Porter | Drink. Blog. Repeat. 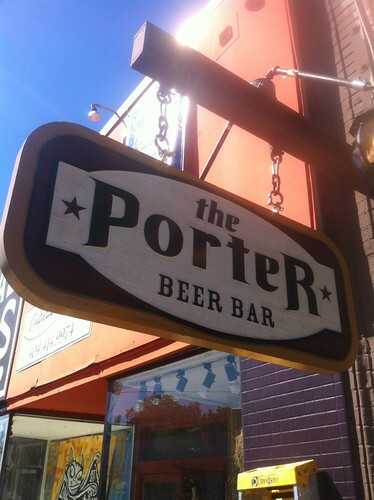 On my last day in Atlanta for my birthday/Atlanta Beer Week , I wanted to hit up The Porter Beer Bar in Atlanta’s Little 5 Points. One of the earliest events the bar – rated as one of the best bars in the world – had planned was a Belgian beer brunch featuring various vintages of Pannepot, the world-class Belgian quad from De Struise Brouwers in Belgium. I had never had the chance to try a Pannepot before, but any Belgian quad that comes with that much hype has got to be good. (See: Westy 12, Straffe Hendrik Quad, Rochefort 10). 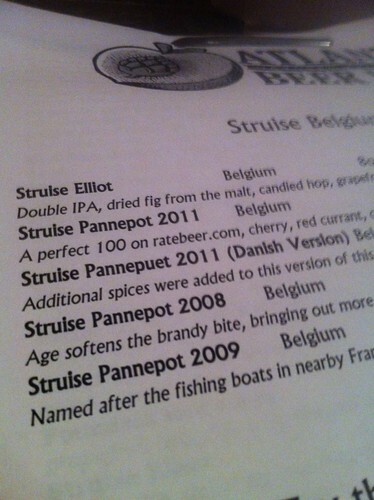 On hand were three vintages of Pannepot – 2008, 2009 and 2011 – as well as the 2011 Pannepeut (the “Danish” version) and Elliot, their Belgian-style double IPA. The Elliot was a really unique DIPA. It had that classic hazy orange color, and on the nose was a lot of grapefruit and a bit sweet hop note. The taste was full of dank, sticky pine notes with a big resinous quality, but there was a very prominent fig flavor as well. I wasn’t really expecting it, and it added a really nice unique note. The 2011 Pannepot – the latest vintage – tasted very young. It had that classic deep black color to it. On the nose were the standard notes of figs and plums but it was backed with a big brandy sweetness. It wasn’t too boozy, though. 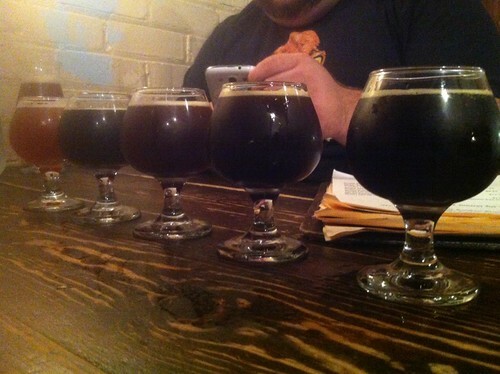 The mouthfeel was very rich and smooth, and the flavors of cherries and dark cocoa were very present. The finish had just a very slight hint of alcohol to it. The 2011 Pannepeut had a slightly lighter color to it than the regular Pannepot. It was a sort of hazy mahogany. The nose had the same fruit flavors of the regular version with a bit of a peppery bite to it. The flavor was full of big caramel, plums and candied sugar with that spice bite on the end. Next up was the 2009 Pannepot. The nose was a tad bit more boozy than the 2011 vintage with a very strong presence of brandy and raisins. The booziness translated into the taste as well as did the classic bouquet of figs, caramel and raisins. Last but certainly not least was the 4-year-old 2008 Pannepot. There was a bit more of a rich cola note on the nose and the flavor was very similar to that of the 2009, but it had clearly mellowed with age. It was a bit smoother on the palate and had a richer flavor than the younger vintages.